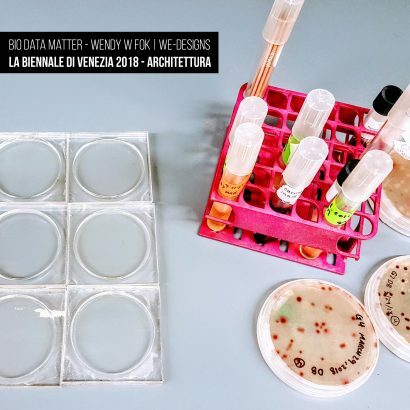 BIO DATA MATTER for La Biennale di Venezia Here’s a taste of our work-in-progress for our BIO DATA MATTER project at WE-DESIGNS, LLC. In the future of urban living, as citizens of global cities, and the circular economy, we often-overlook the sources of the micro-biotic and digitally data embedded lives we live in. The future of cities is now; and the people powering that future live and work in cities, bringing their energy and ideas to bear on the unique challenges and opportunities of urban life. Our design objects are a means to represent bio-data regarded matter within simple geometric vitrines, which contain vital bio-matter and bio-data about New York City. Through using bio-degradable materials and organic matter in the process of making, such as bacteria formed from mycelium, water tested e-coli, and glycerin embedded air particles, these objects use data sourced from the five boroughs of New York City represented as 3D visualized information, through digital fabrication methods. Each individual design object is carefully curated with active biomatter embedded with data that represents New York City, to critically provoke a dialogue between the microscopic biological and digital data embedded lives we live in. Above: Petri-dish bacteria and e-coli were incubated and performed by Marcus Banks, the New School. 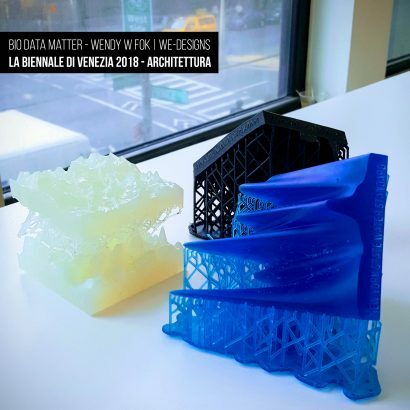 ‘DATA & MATTER’ Exhibition Modes of perceiving, experiencing and inhabiting cities are radically changing along with a radical transformation of the tools that we use to design. Cities, buildings, bodies are complex and systemic organisms requiring approaches that engage new multi-scalar strategies to connect the physical layer with the system of networked ecologies. Over the past two decades, we have witnessed a series of projects with an interest in shaping architectural form coining terms such as ‘datascapes’, and more recently, ‘atmospheric thinking’. In these projects, computational technologies inform new relationships between information and matter, code and space to redefine new urban ecosystems where light, temperature, humidity, and biometric data are pre-conditions for spatial form. This exhibition presents a group of projects by leading international designers using emerging and novel forms of reading and producing spatial conditions that connect/visualize data, responsive systems, and sensing/actuation technologies, through micro and macro scales. The exhibition takes the opportunity to exhibit a range of projects, side by side, that transform data as an abstraction into spatial and experiential configurations. It aims at triggering discussion and debate on how the use of data in design methodologies and theoretical discourses have evolved in the last two decades and why processes of data measurement, quantification, simulation, ubiquitous technologies and algorithmic control, and their integration into methods of making architectural form and spatial experiences, are becoming vital in academic and industry practices. WE-DESIGNS™ provides creative strategy for the built environment. We are hustlers, designers, educators, architects, but most importantly, creatives. Copyright © 2018 WE-DESIGNS, LLC. All Rights Reserved.